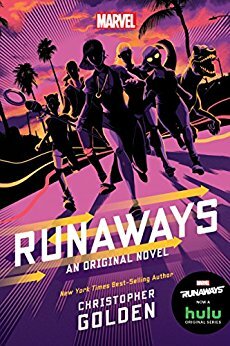 This week's Book Giveaway is Marvel's Runaways, by Christopher Golden. It has "An Original Novel" as its official subtitle, which is a little confusing: it's based on the Marvel comic series of the same name, but it appears to operate independently from the storylines created in either the comics or the TV adaptation. A full review will follow shortly, but be warned: it will be rife with possibly confusing spoilers for fans of this story's other formats.